Your body normally cools itself by sweating. During hot weather, especially when it is very humid, sweating just isn't enough to cool you off. 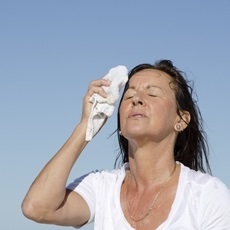 Your body temperature can rise to dangerous levels and you can develop a heat illness. Most heat illnesses happen when you stay out in the heat too long. Exercising and working outside in high heat can also lead to heat illness. Older adults, young children, and those who are sick or overweight are most at risk. Taking certain medicines or drinking alcohol can also raise your risk. Heat stroke - a life-threatening illness in which body temperature may rise above 106° F in minutes. Symptoms include dry skin, a rapid, strong pulse, dizziness, nausea, and confusion. If you see any of these signs, get medical help right away. Heat exhaustion - an illness that can happen after several days of exposure to high temperatures and not enough fluids. Symptoms include heavy sweating, rapid breathing, and a fast, weak pulse. If it is not treated, it can turn into heat stroke. Heat cramps - muscle pains or spasms that happen during heavy exercise. You usually get them in your abdomen, arms, or legs. Heat rash - skin irritation from excessive sweating. It is more common in young children. You can lower your risk of heat illness by drinking fluids to prevent dehydration, replacing lost salt and minerals, and limiting your time in the heat. Article: Renoprotective effect of oral rehydration solution III in exertional heatstroke rats. Article: Heat-Related Illness in Children in an Era of Extreme Temperatures.